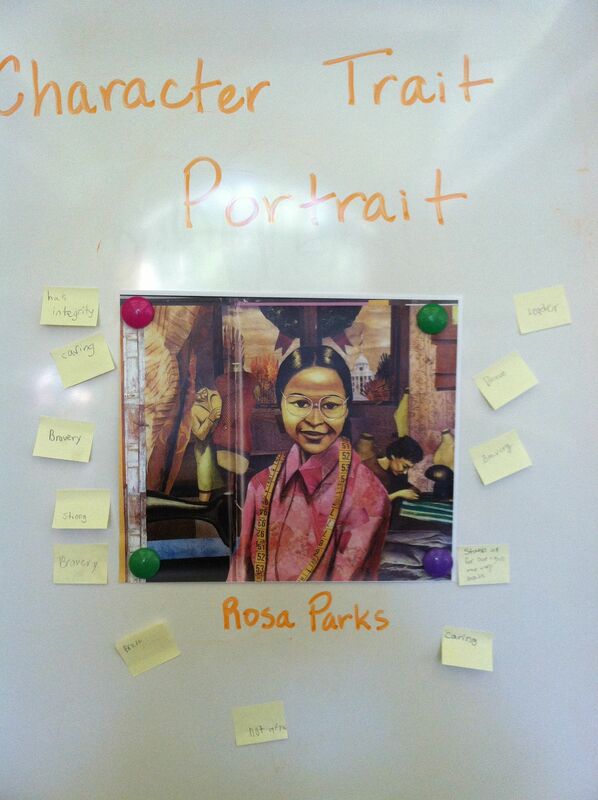 Fifth graders did a Visible Thinking Routine this week called Character Trait Portrait. Before reading the excellent picture book Rosa by Nikki Giovanni and brilliantly illustrated by Bryan Collier, we discussed what a character trait is. Then each student offered a one of their own character traits. As we read the book we stopped and discussed how Mrs. Parks’ actions illustrated her character traits and when the story concluded, each student wrote trait of Mrs. Park’s on a yellow sticky note and circled a copy of an illustration from the book I had posted on the whiteboard. After they did, each student gave an example from the story of the trait they wrote. It made our discussion deeper and more meaningful as students gave evidence for their opinions and related character traits of their own to those of Mrs. Park. Kindergarten–After doing a thinking routine called See, Think, Wonder from a slide from the book, Kindergarteners loved Tedd Arnold’s No More Jumping On the Bed. By setting the stage for the story with the thinking routine they had great fun predicting what was going to happen next and loved the twist at the end of the story. Next week, we’ll be back with William and his brother in No More Water in the Tub. They can hardly wait! First, Second, and Third Grade–We continued with our California Young Reader Medal Nominees this week. This year we have a great group of choices. A Bedtime for Bear written by Bonnie Becker. Illustrated by Kady MacDonald Denton. Candlewick Press, 2010. Bats at the Library written and illustrated by Brian Lies. Houghton Mifflin, 2008. The Sandwich Swap written by Her Majesty Queen Rania Al Abdullah, with Kelly DiPucchio. Illustrated by Tricia Tusa. Disney/Hyperion Books, 2010. Memoirs of a Goldfish written by Devin Scillian. Illustrated by Tim Bowers. Sleeping Bear Press, 2010. We Are in a Book! written and illustrated by Mo Willems. Hyperion Books for Children, 2010. Students love the fact that “grown-ups” can’t vote and they get to make the choice for their favorite. Each week I will read different books to different classes and then with “official” ballots they will vote. We come up with our school winner and then send our votes to the State level and see who the State winner will be. This is one of their favorite activities in the Library. Fourth Grade–For Black History Month, fourth graders heard Matt Faulkner’s excellent book, A Taste of Colored Water. Before reading the book I projected a slide from the story and students did the thinking routine See, Think, Wonder. The illustration I chose was one of the more dramatic ones showing the two young protagonists observing a clash between peaceful protestors and police and fireman aiming fire hoses at them. They had much to wonder at. This book is a powerful but simple portrayal of one of the terrible injustices faced by African Americans during the Civil Rights struggles in the 1960s. Telling the story through the eyes of two white children give it an accessibility to today’s students. A very worthwhile book to have. 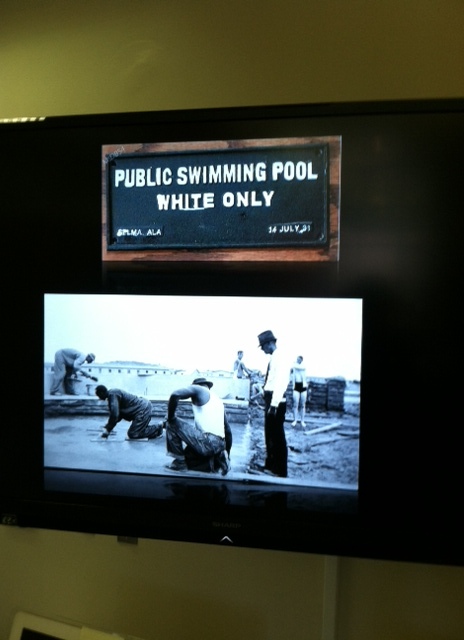 Sixth Grade–Sixth graders viewed these two photos before hearing Deborah Wiles excellent book Freedom Summer. We used two Visible Thinking Routines for this lesson. The first one was See, Think Wonder. Students looked carefully at the two photos and talked about what they noticed, focusing on the details. Next they speculated about what was happening in the photos and last spoke about what they wondered about them. This set the stage for the reading of the book. The book is the story of two boys who are best friends–one black, one white–and the thrill they feel when they believe they will be able to finally swim together in the public pool in their town. Jerome Lagarrigue’s evocative, impressionistic illustrations were a counterpoint to the stark black and white photos they had just looked at. As the story progressed and the town’s pool was filled with asphalt to prevent the integrated use, students were stunned. Many had thought the photos were of the pool being built so all could share it. We finished with the thinking routine called One Word. They summarized the story using one word, wrote that on a sticky note and posted it on the whiteboard. They one by one they gave evidence to show why they chose that one word. 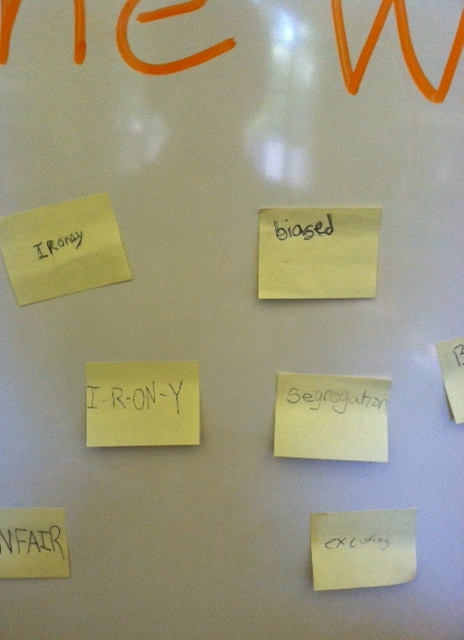 I particularly liked that several students chose the word irony and when asked to explain their choice pointed to the fact that it was the blacks who were forced to do the work to fill the pools with cement or asphalt.